One of the first questions I usually get at book signings or in front of groups is how I managed to write, publish and sell four novels in the five years after I turned seventy. The honest answer is I didn’t. I had drafts of Ratham Creek, Maternal Harbor, and Harbored Secrets on a shelf in my closet for years before I dared to do anything with them. I had sent them around to different agents and publishers only to receive the dreaded rejections. I set them aside and lived life. Several months after my husband passed, a writer friend phoned and invited me to have brunch with her at a lovely shop tucked away from Main Street. After we ordered, Angie looked me straight in the eyes and told me, “Your stories are too good to be sitting on a shelf. Get one out, polish it and publish it on Amazon.” I like this gal, but at that moment I thought she was crazy. But…she’d planted the seed. I reworked Maternal Harbor and hired a fellow to format and upload my manuscript to the Kindle program. He helped design a cover and my book went live. I remember sitting in front of my computer admiring my book’s sale page. Nice, but how on earth would anyone find it, let alone read it? I knew I needed help in promoting my story. I found it at a group called Authors of the Flathead. There, I learned about websites that promote Kindle books with free sale days. I set up my first promotion, paid my twenty-five dollars to a promoter and waited. And panicked. After all, that was my money at risk. I also found a few websites that did no-cost promotions. They agreed to include my promotion in their emails. Did the promotions work? 20,184 people downloaded my free Kindle book. I couldn’t believe it. More unbelievable is 830 copies then sold for $2.99 a download. That was my beginning. Reviews on my book began to trickle in. I suffered with each one. The readers seemed to like the story, but kept remarking about errors and typos. Good grief. I thought I had found them all. I learned I need lots of proofers. I cannot see my own misspellings or missing words. A couple of gals proofread it again. We fixed a ton of mistakes. I reloaded the new version and continued to run free promotions and paid for promoters. Some months I made money, others I lost. At the same time, I designed my own website and Facebook author’s page, trying to save as much money as possible to invest in professional covers and other expenses. I also rewrote another manuscript. Harbored Secrets went up for sale on Amazon five months later. It turned out to be my most successful book according to reviews and sales. It too makes money and loses it. But I always seem to earn more than I spend. As of a month ago, my combined Kindle books have been downloaded by more than 500,000 readers and have received over 1300 reviews. Almost 700 of them are five stars. That pretty much covers the nuts and bolts of my self-publishing, but I think to be successful, a person first needs to have a story readers can relate to. Mine are stories of women, strong determined women, who fight for what is right and good. In my first book Maternal Harbor, Teagan owns a fish shop in Seattle. She is pregnant and alone after her boyfriend walks out on her. She meets and befriends three other single moms at her OB-GYN clinic. Teagan ends up having to protect all the babies from a grief-filled insane woman. In the second novel Harbored Secrets, readers meet middle-aged Blinny Platt, who is building her very own house in the middle of the Montana prairies. As she pounds nails and pours cement, memories of her childhood won’t leave her alone. Through her recollections, the reader learns her story of survival. In Ratham Creek, Arianne makes a new life for herself after her husband dies and leaves her nearly destitute. She moves to a wild Montana mountain to live within her means and start again. 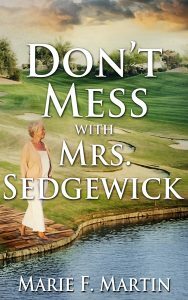 Don’t Mess With Mrs. Sedgewick has four smart, fun-loving widows who just want to live the good life in a quiet companionship. Doesn’t happen. A blackmailer targets them and their world is turned upside down. As you see I choose to write about the needs of women. To be independent, strong, yet love to the fullest. Where I find the heroines of my stories is in my family and friends. Take a deep look at who you know, their mannerisms, their actions over the time you have known them. Don’t look for just the good things but recognize the defects. We all have them. Good believable characters are built from the defects and how they overcome them. I found success with my writing only because I didn’t give up. I never fulfilled my first desire to have my stories published by a major publishing house, but I do have hundreds of thousands of readers, fans who write me nice emails and reviews. Fans who get excited to shake my hand or receive a hug or a free paperback. Publishing after your hair turns white is just fine. This entry was tagged Self-Publishing, Women Writers. Women's Books. Bookmark the permalink. Great article Marie. Wishing you lots of sales in the new year!